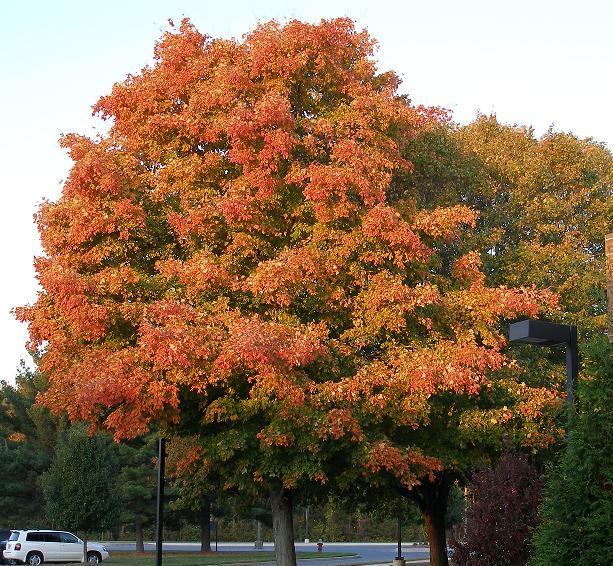 Such a nice day at the Terry Campus of Delaware Technical and Community College, too bad we'll spend it inside the Conference Center and then a house. All photos taken and owned by the Desk. If any of the parties involved request that their image be removed, it will be replaced with one of the 200 or so others taken that day. Ahhhh, where do we begin? Perhaps with an explanation of exactly what a "Cyber Brief" is. Well, it would appear to be a half day session devoted to one topic. But in this case, that definition doesn't work. So we'll move on and try to define it as we go. The Desk. As is the Desk's M.O. tends to move in and take over. And this event was no different. 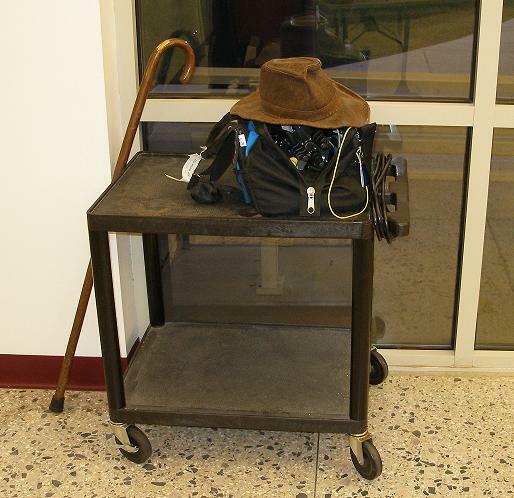 From borrowing a Delaware Tech AV cart for the duration to moving trash cans and hijacking a stack of chairs. The Desk does what it needs to do to make its life easier. Which also meant laying claim to some breakfast before things got going. 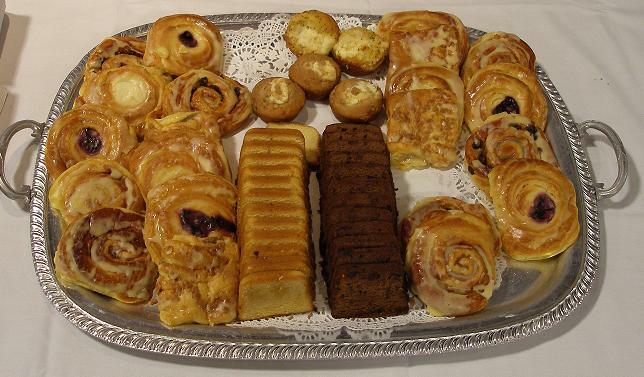 And here you have... rolls and coffee. the gentleman in the picture is an attendee and NOT the Desk. Then there was the Registration Desk and its display. 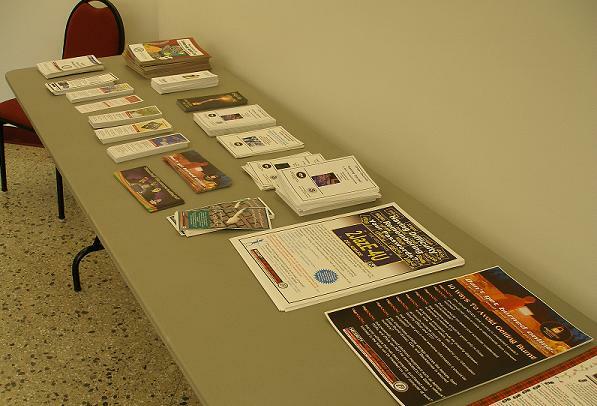 A table full of information. 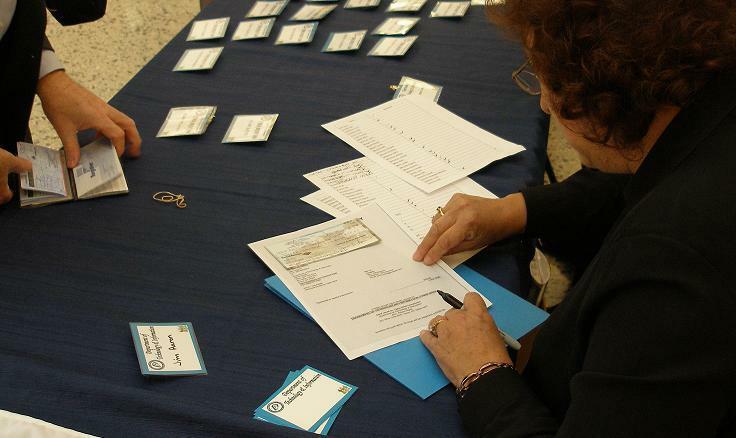 About a hundred and eighty people had registered for the event, and by the Desk's count, there were almost that many there, probably easily a hundred and fifty or so. 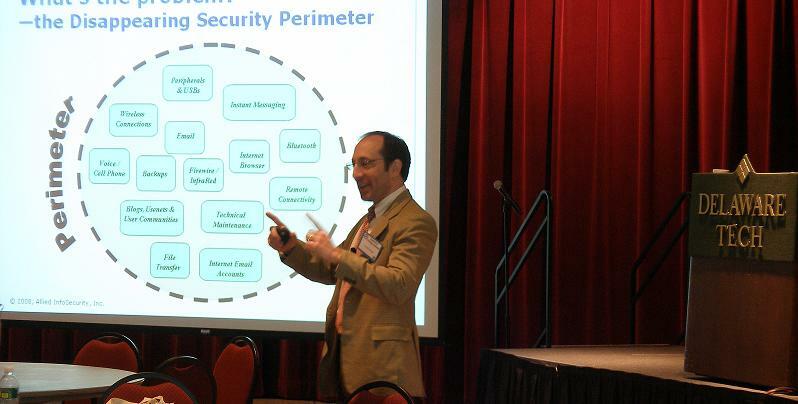 There were attendees from the sponsoring organizations, namely Delaware's Department of Technology and Information and the State's Department of Labor, as well as several other agencies, several business entities including Sungard, Allied Info Security, Cisco, and a few from various local businesses. There is a definite and significantly important job-related reason for this picture to be part of this photo essay. Yes indeed. As soon as the Desk comes up with one, it'll update the page with it. And of course there was a pretty woman to welcome you to the conference and hand you an agenda. "She is the Security Officer of DTI and, being that this event was the main feature of the cyber security month, greeting her clients falls nicely under her job responsibilities. Besides, she worked the crowd..."
It works. We'll use it. Now to the content of the event. Yes there was content. Coffee. Rolls. And Content. 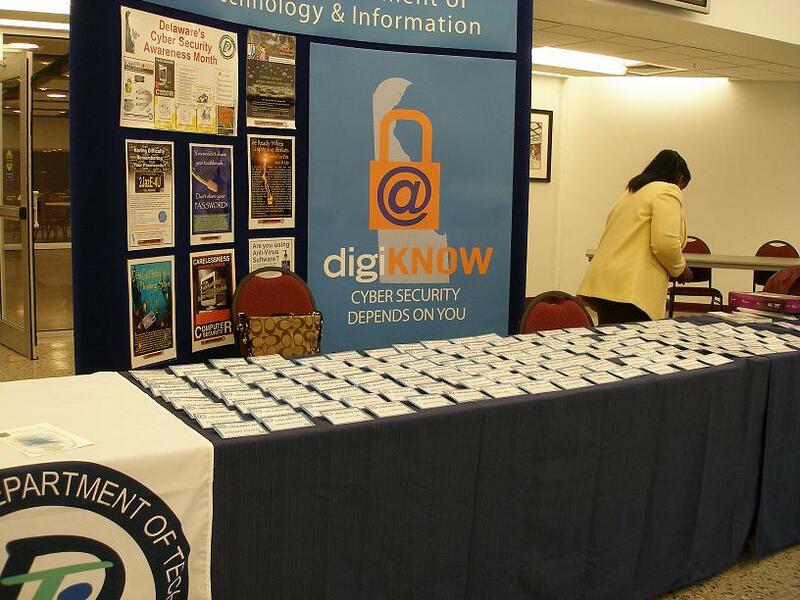 First up was the Cabinet Secretary of DTI Thomas Jarrett who welcomed the attendees and announced that DTI's online security initiative for the year was on target to reach almost every fourth grade student in the state by the end of the school year. Considering that two years ago this effort was only able to reach somewhere on the order of two hundred students, the progress is amazing. The first speaker highlighted the importance of humor in the workplace to keep morale and productivity up. Humor enhances creativity and builds a sense of team in the office. It breaks stress and encourages people to come to work. Those who have a sense of humor are often healthier and have a greater sense of well being than those who don't. Doctor Sharon Yoder is an expert, if that is the correct term to use, in what place and function a sense of humor has in the workplace and the day to day functions that make up most businesses. Now, we are NOT talking about, and this is the speaker's words, we are NOT talking about humiliating or embarrassing comedy (as highlighted in another Desk article linked below). But an overall sense of fun and enjoyment in being where you are and doing what you are doing. The lady pointed out that you can get college degrees in humor and that major companies are now hiring people with those credentials to help them retain employees and get more done with the ones they have. And the reason is very simple: it works. That and that since humor is something that can be learned, a sense of humor isn't really genetic, most people can be taught and you don't have to spend millions of dollars on specialized exercise equipment like web-enabled treadmills... more on that in a minute. It is often said that well used humor reduces learning time and increases retention. Everybody knows how preachers will try to insert jokes into their sermons as both 'comedy relief' and to punctuate an otherwise serious message to help people remember it. However, a badly delivered line, or something that is impropriate can destroy everything said up to that point. And the same is true in the office where not only can something off-color or badly done can not only tear the team apart, it can land everybody in court. Which just causes more stress. The best, and SAFEST form or humor, according to Doctor Yoder, is self depreciating 'telling on yourself' type stories that most other people can relate to. The gentleman was a very good speaker, knowledgeable in his field, and presented good information. Now... as to WHICH speaker he was, the Desk's notes are somewhat confused. The next speaker was Mr. Carl Herberger from Allied InfoSecurity. Mr. Herberger is a walking source book on all things related to Social Engineering both inside and outside of the workplace and the world of Information Technology. Not every scammer attack comes through email, not every Phishing attempt comes in the form of a claim that you won a foreign lottery that you have never heard of. And the gentleman knows all about it, and, give him enough time, he'll share it all with you. But first he came to a full stop and showed a picture of his dog and explained that his is a somewhat esoteric world, with its own language, and that he will try to explain the lexicon as he goes. But you can boil it all down to one central idea. Social Engineering in simply: Manipulation with intent to Defraud. Oh, yes. That's a crime. Which is a detail that has not slowed the bad guys down one bit. Now, how do you protect yourself against those very bad guys that are constantly sending emails, making phone calls, sending actual surface mail, and even putting ads in newspapers and magazines with everything from work at home scams to claims that they are your boss and there is an emergency and they need your log on ID and password? Well. The Desk would say "don't be gullible" but even the Desk has fallen prey to a half-scam home improvement fraud. But that's another story and potential criminal case, so we'll move on. Those who run social engineering scams play off one or more weaknesses that most people have. So we'll list them. Most People want to be Liked and be Helpful. They want to Avoid Confrontation. The majority of people want things to be Convenient. Also, people are Messy and Disorganized. And, a lot of people are Curious and Nosy. If you as a scammer can work off a couple of those traits, you've got it made. Security Officers are the ones who try be helpful and train those traits out of their people, which means they are not liked because it is a confrontation that is not convenient, and training can get messy and be disorganized if you are curious and nosy. Gifts for the speakers from the Committee. The final speaker of the day was Mr. Patrick Gray, formerly of the FBI, currently of Cisco Systems, and who not only had been there and done that, he had bought the drugs and chased the bad guys and met the hoods and.... well, that's another story. The bottom line here is that the Web as we know it has changed dramatically in the last couple of years. And the bad guys that use the web for fun and profit have changed in the last couple of years. There are 162 known terrorist organizations represented on the web. There are gangs of criminals on the web who steal millions upon millions of dollars, euros, yen, and everything else every day from millions of people, organizations, and even state and city governments. There are foreign governments, rival companies, and some people who are simply out to see what they can do. There are fourteen year old punks, and career thieves, and disgruntled employees, and just guys who click on links in spam emails to 'see what they have' (see link below). And ALL OF THEM are out to corrupt your network and kill your computer and lose your data. And oh, by the way, the easiest target for outside hackers to break into as a gateway to other networks including banks and government offices. .EDU (education) sites. The last note the Desk has from Mr. Gray is something about default passwords and CPU cycles. But that's where that one ends because it had to run out and take part in a ceremony on the other side of the coin. From Cyber Security to Family Security... of a sort. 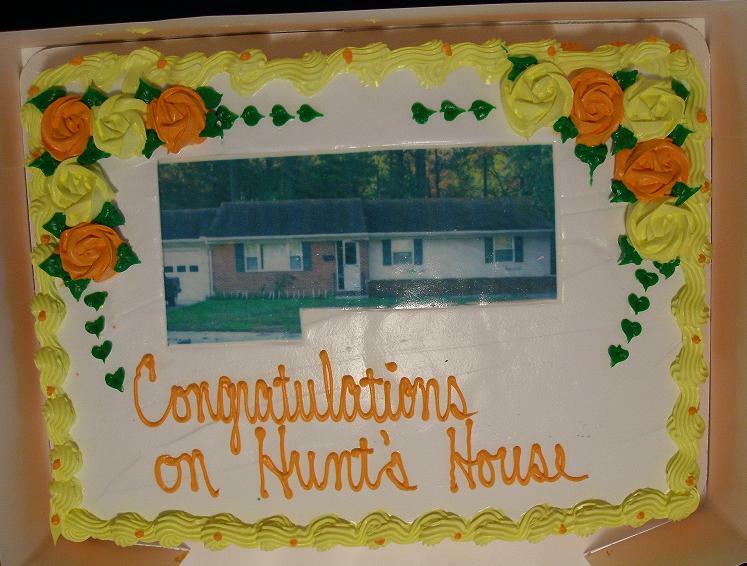 The cake celebrating the dedication of Hunt's House. The Shepherd Place Inc. is a family shelter in Dover Delaware. It was founded some twenty years ago by Father Hunt who felt an acute desire to work to meet the need of those he saw in the Dover area who were homeless. The Shelter provides housing, case management, food and other basic needs at no cost to those who need them. Those needs include clothing and other items as well as a limited amount of household supplies to those that move from there into their own home or apartment. And the vast majority of that which is provided to the clients during their state law mandated thirty day maximum stay, as well as former clients, is donated by the community. The Shelter itself receives no direct Federal aid. Those clients who can work are encouraged and assisted with finding employment, those who cannot receive whatever assistance they need with getting the ongoing support they need. They also receive help finding permanent housing, or if needed, space in another shelter when their Thirty Day stay at the Shepherd Place is over. And now part of that assistance is Transitional Housing. That step between being in a shelter and being in a more permanent leased space that will be 'theirs'. And, as with the shelter itself, it is provided at no charge. The money the client earns is saved for things like future down payments and deposits on utility service. The list of restrictions on who is eligible for the place is long. They must be employed in a stable long-term job, they must not have outstanding legal trouble, they must not have a history of substance abuse or have successfully completed treatment and remain clean, the family must be stable and school age children must be enrolled in school, and .... and so on. Yes the restrictions are tight, but the need is great, and the house had a waiting list before it was more than a gleam in the Shelter Director's eye. 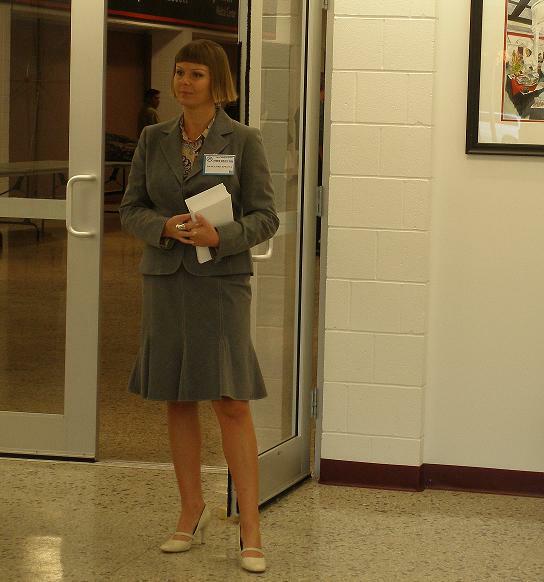 The Shelter Director Ms. Hammond, and Board President Mr. McGrath. "That's Executive Director." The lady reminded the Desk. The shelter averages about 450 clients a year, of which about half are children. The reasons they come through are as varied as the people themselves. The usual stories include domestic violence, substance abuse, and personal tragedy such as a fire. But there are also those who have been caught up in somebody else's mess and are now on the street and that kind of thing. The case management services offered are client specific. No, they do not tell the unemployed master electrician or a school teacher who is between assignments to "go to GED class" as some other social service outfits have been known to do. The shelter's staff will tailor the plan to meet their needs. Such as the electrician mainly needed a job and a ride to it and the teacher needed to update her resume. 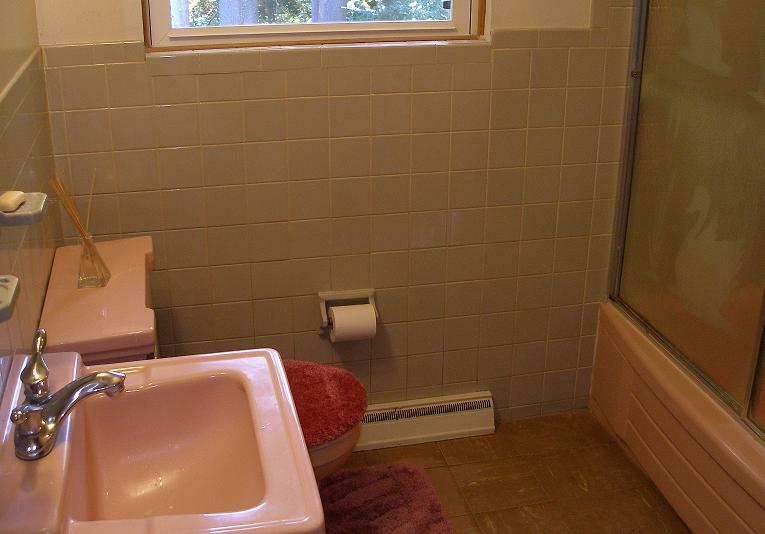 The pink bathroom is simply a sign of when the house had been built. Maybe the color will come back into style. Besides, the Shelter owns the house outright, so you don't make a big deal about the color of the bathroom fixtures do you? The only ongoing expenses on it are utilities, maintenance, insurance, and taxes. The house came to the shelter through a series of contacts and negotiations and just marvelous coincidence and happenstance, and a lot of work, and phone calls and letters, and fundraising, and all the legal things that go with such an endeavor. And then it had to be almost completely remodeled, cleaned inside and out, and the floors done, and new paint, and appliances, and donations of paint and cleaning and appliances sought out. And more fundraising, and more letters and phone calls and..... But from where the Desk was standing, now that the Hunt House facility is open.... the REAL work will begin. 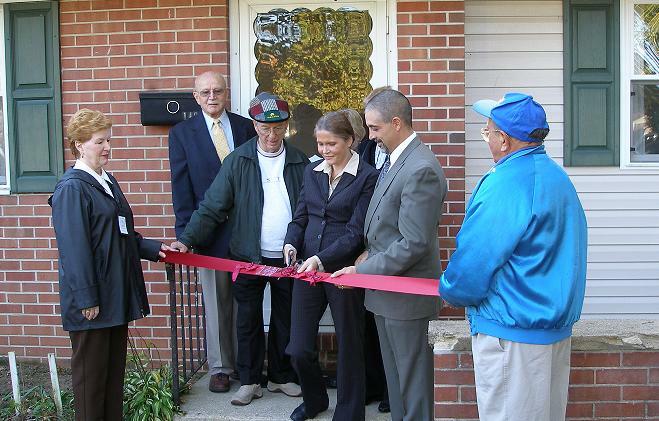 The Director and the Board President are joined by members of the shelter board and staff for the ribbon cutting. 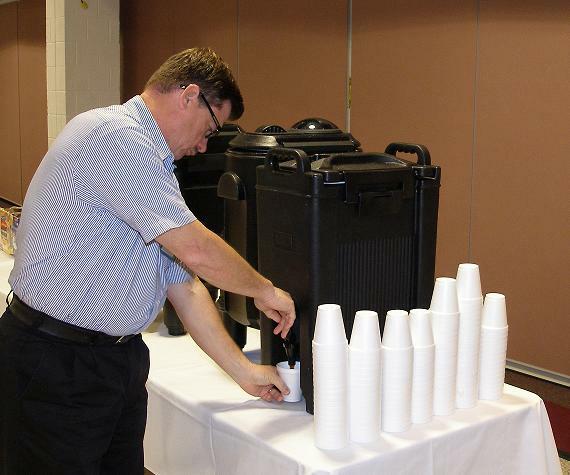 The Shelter is a United Way agency, yet is also relies heavily on the good will and continued support of those individuals, organizations, and businesses in its community and elsewhere to continue its good work. And for the record, the Desk will now also be assisting them with updating and maintaining their webpage. 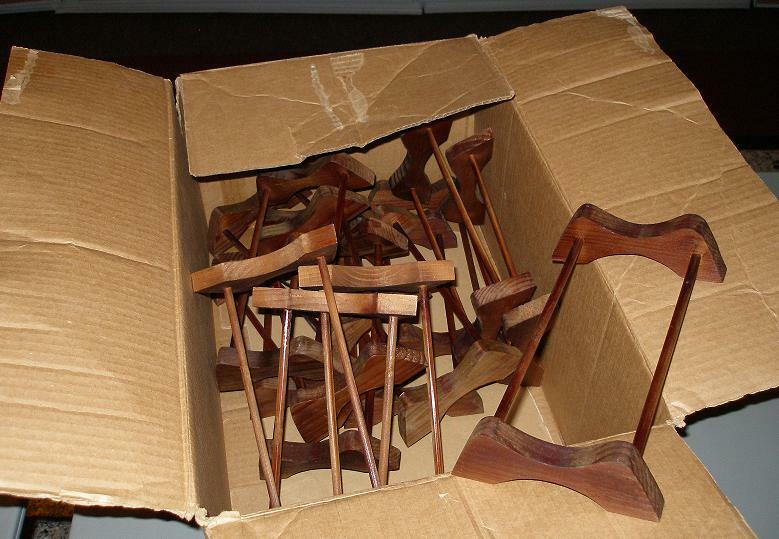 But nobody ever explained what these were or why they were there. "Unbutton your beast"?, the sequel to the Desk's last article about what TV producers think of their customers. The title of the article was the Desk's answer to the statement "I click on them just to see what they've got"
[NOTE: Thanks to (in no particular order): Delaware Technical and Community College. The Delaware Department of Technology and Information. And the other assorted vendors and participants in the Conference.